Building a classroom library has been the task of my career. From a number of sources--school hand-me-downs, used book sales, online purchases, book clubs, and favorite bookstores on vacations, I've put together a library that I hope is inviting and interesting. These show up all the time at quality used book sales and discount booksellers. I've purchased enough so that I can put a poetry book in every student's hand when I teach poetry. This is so helpful! 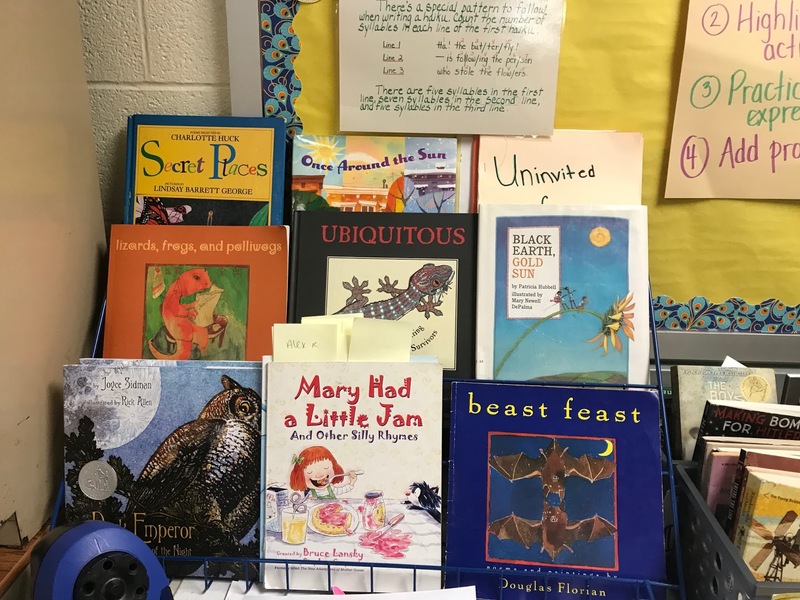 We can talk about characteristics of poems--"Some have short lines, and some have long lines" or "Some poems have formal rhyme schemes, while others do not"--and kids can page through their books and find examples right there! Then they trade books around and look for more. I keep my poetry books in a separate tub and only have them circulate occasionally, with a few book displays during the year. This prolongs their lives and keeps them in high demand! 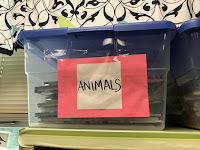 Over the years I've created book bins for a number of different authors and series, mostly for books that my students have requested or that my own children have read. I do prioritize filling in these series over starting new ones. And many of them are remarkably popular! Our series has some excellent story excerpts, so I'm working on purchasing the entire works as well as other books by the authors featured in the series. Larger used bookstores like 2nd and Charles are great sources for this. I justify my spending on it as "Well, this is my hobby!" To be honest, many books started out as purchases for my two sons, now 19 and 13, and then made their way into my classroom. So when my youngest wants to buy Endling or Miles Morales at the independent bookstore at the beach, I'm inclined to say yes! 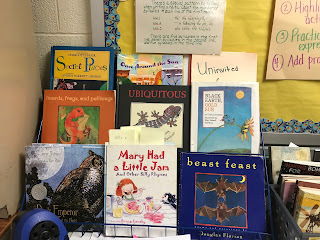 I really enjoy having nonfiction picture books to set out as book displays for each unit. As with the poetry books, I usually keep these in their own stackable tubs and put them out of general circulation. I want my classroom library to be as rich and varied as the world itself! The books that I seek out and purchase new are often books that are selected to add a diversity of experiences and cultures to my classroom library. From Aru Shah and the End of Time to Pashmina to Witch Boy, these books often become the most requested. It's not all bad news, though. In fact, I've learned a fantastic technique for helping students to become better writers AND learn grammar at the same time. This technique is simple, easy to use, and easy to differentiate. What is it? That's it. And this year, I really want to go back to this technique (I've been rather pressured to do the worksheet method over the last two years) to start the year. Students learn how to identify the chunks of sentences: Sentence parts like subject, verb, and prepositional phrase become more concrete when students break sentences into meaningful chunks. Students gain control over their writing: When imitating sentences, students learn how to merge content with form. They don't use a particular verb form because it's the first one they think of, but because it's the verb form that is used in that sentence. Students try new forms: Sentence imitating is a great way to get kids noticing and using more sophisticated sentence forms. 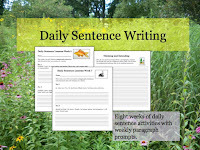 It's a powerful way to help students notice the beautiful portability of adverbs and adverbial phrases, the use of punctuation in a sentence, and the way that authors can use repetition for style and effect. To read more about sentence imitating and sentence composing, visit this website by Don and Jenny Killgallon. You don't have to have fancy materials...all you need are some great sentences and a sense of adventure! Take sentences from your literature series, from a book that you are sharing, from the day's read aloud. 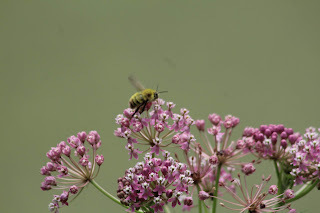 I've had so much fun taking photos this summer! My students know that I take my camera everywhere, and often I'll start a Monday morning showing the pictures that I took over the weekend. "You go on so many adventures," a student told me wistfully. At first I was surprised by this, because I didn't consider my trips to the local state parks adventures. I consider myself a pretty boring person, actually; adventure has never come knocking on my door. But then I thought about my pictures of frogs and snakes and snakes eating frogs and realized that maybe I'd been having adventures all along. 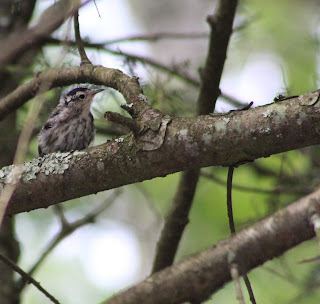 A black and white warbler fledgling looks for bugs in an eastern hemlock tree. I was at the campground in Caledonia State Park when I took this, waiting for family to arrive. I heard what I first thought was a cardinal. Surprise! It was this little guy and its parent, softly keeping contact as they foraged for bugs. "Love in a mist" is the name of this plant, and the seed pods are just so interesting. This picture was taken in the very un-adventurous trial garden at the local Ag Center, right across the street from a grocery store and community college. But we were wandering the garden on a rainy day, which always makes things seem a little more exciting. 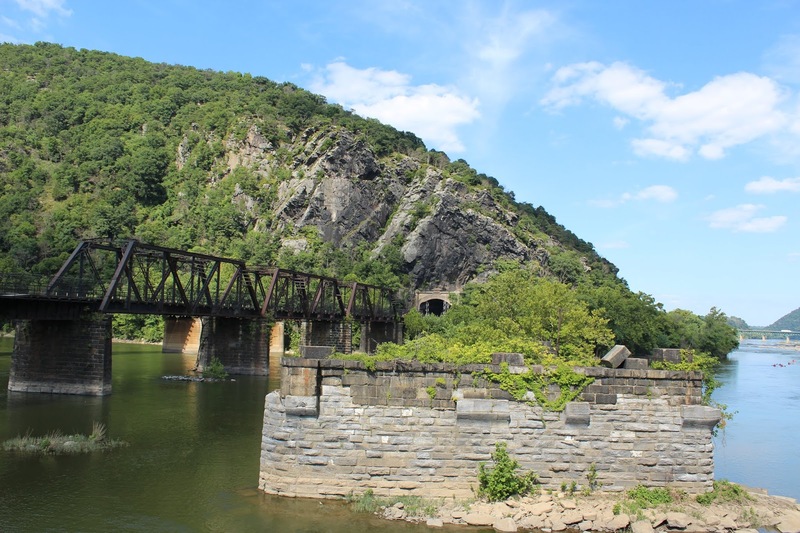 The last picture is of the view from Harpers Ferry in West Virginia, one of my favorite spots. Last week we went on a tubing trip on the Shenandoah River. I've always loved visiting Harpers Ferry and always wanted to try a tubing trip. It was mellow and fun and the scent of sycamores was intoxicating. What adventures have you been enjoying? 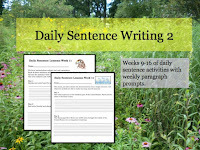 There are lots of ways to build the component skills of summarizing without forcing kids to write summaries every day. Here is a super-simple activity that requires very little prep! 1. Choose a text that all students can access, and that students have read before. In these pictures, I chose "Nail Soup" from a PSSA item sampler. I liked this story because it was told mostly in dialogue, which makes it more challenging for students to read and summarize. There is also the question of the deceit in the story. This gives it a second layer of meaning and makes a reread a more interesting task. We had already read this story and worked through the questions, so students came to the summarizing task with some level of familiarity. This is so important if you're working with summarizing! Students need practice with summarizing stories that are well-represented in their minds. 2. Model reading the text as a shared read. Make it interesting! I used voices for the dialogue, drew students' attention to the formatting, and paused to share commentary. 3. At each event, use a sticky note to summarize what just occurred. This is what makes this a summarizing activity. I paused every now and again to ask students, "Is this important to a summary?" Our discussions were great! 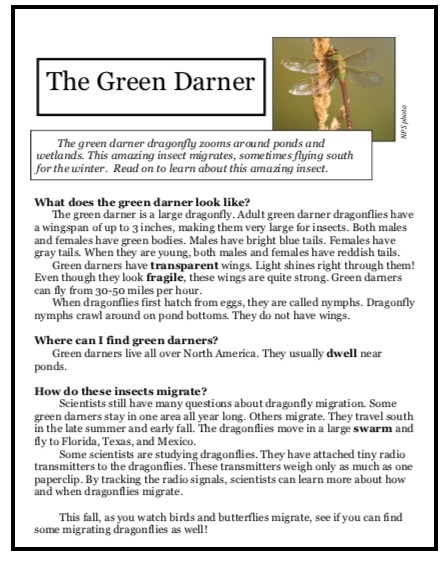 With sixth graders, I emphasized the use of the present tense in writing the summary. (I would probably skip this discussion with younger readers, though.) You could also hand out sticky notes so that students can write their own events. In my case, I wanted students to focus more on the conversation than in copying what I was writing. 4. Use the sticky notes to produce a group summary. I alternated colors in my summary to show that the different sentences came from different events. The word-smithing of the summary took center stage in this case, as it was later in the year and the kids were pretty solid with the basics of writing events. I also bring up the issue of writing our own opinions in the summary. "Can I write, 'This was a great story!'? Why or why not?" There are some who claim that a summary must be free of reader inferences. This is ridiculous! Readers have to make inferences and many of those inferences are key to story cohesion. In the case of this summary, calling the characters "clever" and "stingy" is perfectly reasonable, as they are referred to by those traits in the text. Other character traits might be a stretch. Talk about this with students! Notice that the summary starts with what I call an "executive sentence" that encapsulates the whole essence of the story in one sentence. Readers who learn how to write this smooth introductory sentence are at an advantage. If you've never done this before, I recommend that you try to summarize the story on your own before trying it with students. It's surprisingly difficult to summarize on the spot, especially as you're trying to manage the class and keep an eye on everything else that's going on! As students summarize stories on their own, many of them take the sticky note strategy to try on their own. I love to see that shared activities become part of a set of strategies that students can use flexibly on their own! 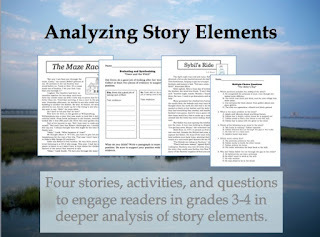 This Summary and Analysis set includes a story that is great for summarizing practice. If you want to give your students an additional challenge, use this Summary and Analysis set to have them try summarizing a drama! 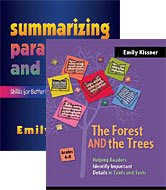 Aimed at younger readers, this set includes a variety of summarizing activities, including practice with collapsing lists of events and summarizing dialogue. Setting Graphic Organizer: When does the story take place? In a previous post, I wrote about how students often find it helpful to collect details about a setting in a setting graphic organizer. 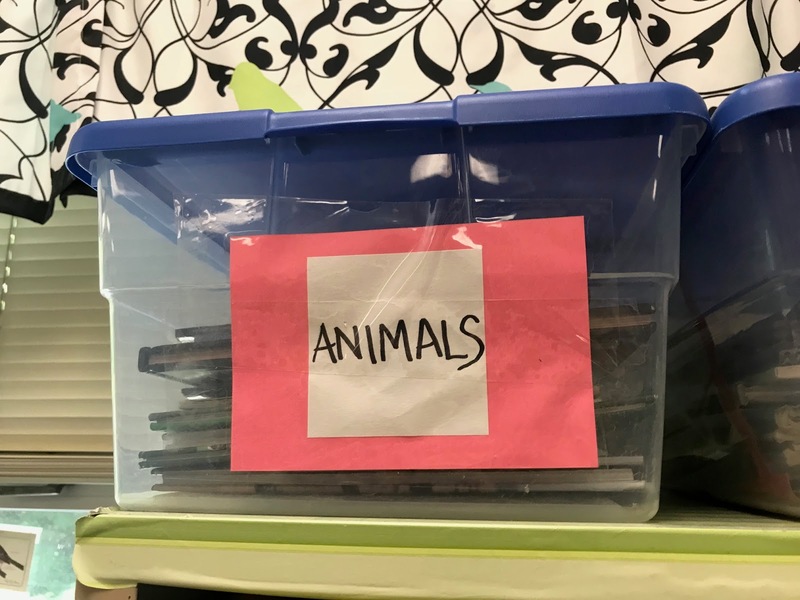 An organizer that cues students to consider details of time as well as place helps them to come to a more sophisticated understanding of setting. Sometimes, though, students have trouble figuring out the time in which the story takes place. It took me a few years to realize that these students don't have a strong internal model for a timeline! The idea of a "fairy tale time" or something off the timeline helps students to realize that some stories don't take place on our regular timeline. 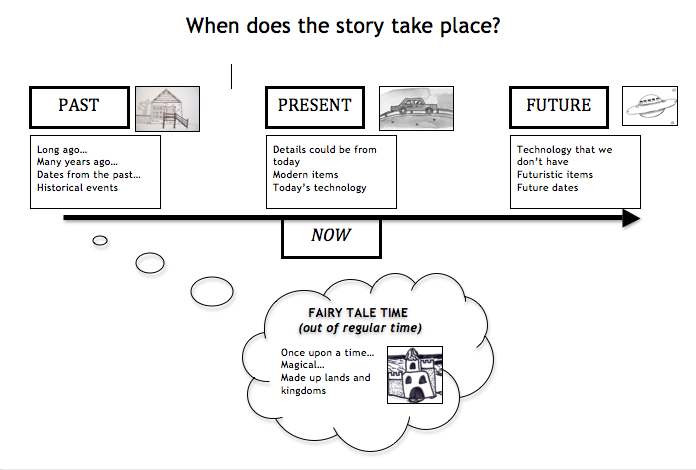 In addition, a classroom timeline really helps students to place historical fiction stories. I adapted this one from TpT to hang up in my classroom, making sure to add events for stories that we would be reading over the school year--for example, adding the Goryeo Dynasty in Korea to go along with A Single Shard, and the year that "Ozymandias" was written to go along with our study of sonnets. Helping students to conceptualize setting as place and time really adds to our classroom conversations! As I think about how to decorate my classroom for the new school year, I want to keep the focus on decorations that are educational as well as decorative. That's one reason why I like to keep a list of Atlantic hurricane names for the year--this serves as an ongoing resource to keep us thinking about hurricanes. 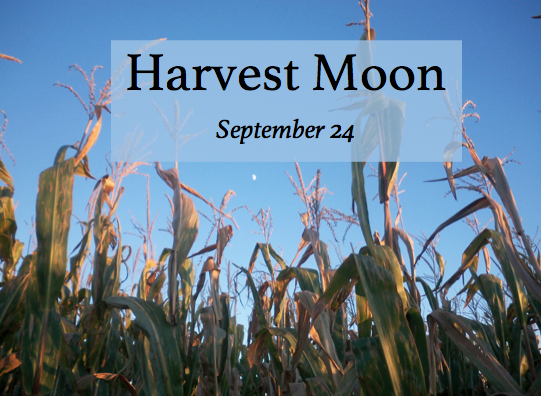 I also like to keep the dates of the full moons visible all year long. Last year, I made a set of Full Moons mini-posters so that we could always see where we were in the moon cycle. A student illustrated small moons that we attached to each poster after the full moon passed. This was a lovely way to mark the passage of time through the year! Of course I didn't take any photos of my posters last year, but you can peek at them next to my hurricane name list to the right. Some concepts are best taught over a long period of time instead of in a single lesson. 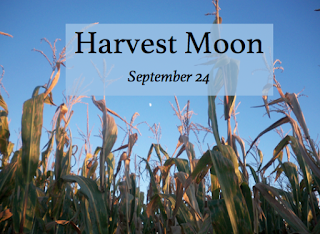 By watching the pattern of the full moon through the year, students learned more about how the cycle works. Summer means it's time to dust off the teaching units and make updates. One of my ongoing projects is to redo my old TpT products, especially working to turn them into easily printable PDFs. The Description Texts for Teaching Text Structure set was originally made to feature articles and activities to help readers understand this important text structure. As I revised and updated, I added some of my favorite texts from other products, looking at building background knowledge and creating strong links to content areas. Of course I couldn't help but to update the formatting as well! I ended up with over 100 pages including 13 articles, before and after reading activities, and answer keys. Once I got started I just couldn't stop. Here are some of my favorite additions! The Green Darner: This article is organized in question and answer format to describe an awesome migrating dragonfly. Originally featured in September Reading Homework, it is a friendly text for helping students to recognize key features of description. I loved researching it! 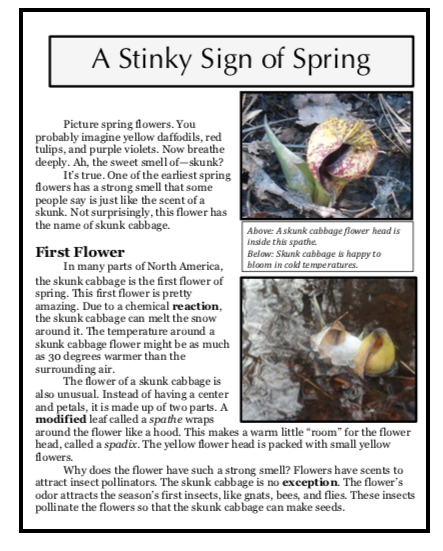 A Stinky Sign of Spring: I adore skunk cabbages as one of the first signs of spring in wet forests. 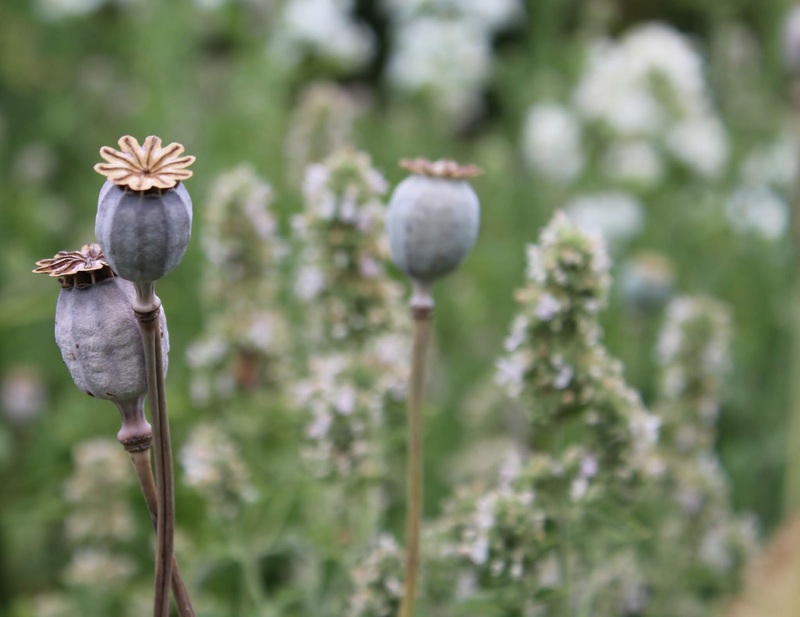 When I put together the March set of homework packets, I included an article about these plants. 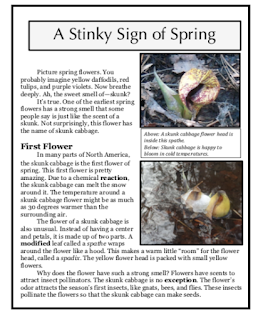 I updated the formatting and added MORE skunk cabbage pictures because they are so amazing. 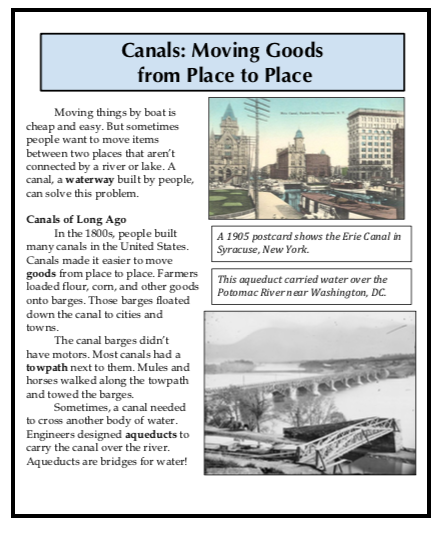 Canals: Okay, so understanding the role of canals in history and early transportation is so important, but year after year I find that kids just have no idea of what a canal is or what it is used for. 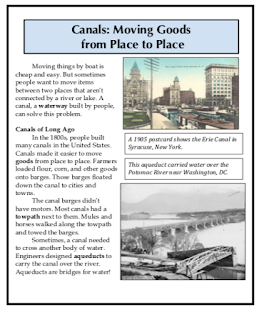 I wrote an article about canals that I used in Daily Warm-Up Activities for Nonfiction Test Preparation, but I wanted to add some prettier formatting. Now it's updated and ready to be used as an example of description/main idea and detail text structure. Remember, if you previously purchased this set, you can download an updated version for free! 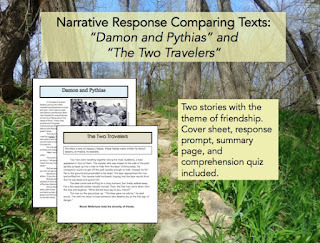 I hope that these texts and activities help you to teach about this important text structure. -How does the setting contribute to the plot? -Could this story have happened in a different setting? -How do the characters interact with the setting? -What is the mood created with the words describing the setting? -How does the setting change over the course of the story? -(For historical fiction) What details about the time period can you learn? With older readers, it's hard at first to help them understand that setting includes both the time and place of the text. Students want to just name the first location mentioned in the story and be content with that as the setting. But often, it's more helpful to name a generalized location. Transitions. They can be a real pain, right? Whether you want to transition from one activity to another, bring everyone back to their seats for a reflection session, or just clean up from an incredibly messy activity, we need a clear way to show students that it's time to move on. But the worst way to transition is to nag at students. "Get this cleaned up!" or "Be sure to look for paper scraps under your chairs!" or "I want this room spotless!" --ugh, I've heard so many rude and disrespectful things that teachers say again and again and again to try to manage the clean-up process. The clean-up song, a trick that I learned from Responsive Classrooms, is a way to get kids actively involved in the transition without having to nag. In fact, once the process has been taught, I find myself saying nothing at all. Adults in the classroom are frequently amazed by how smoothly the students orchestrate the transition. I just smile and wave a hand and deflect the praise to how wonderful my students are. I have a playlist with songs of 2 minutes, 3 minutes, 4 minutes, and 5 minutes. I deploy each one depending on how much we've made! 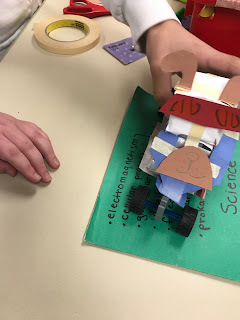 After building our Mars rovers, believe me that I needed a 5 minute song. If kids are just scattered around the room, reading, though, we often only need 2 minutes to get back together. It's important to choose a song that will comfortably allow enough time for clean up. The purpose is not to make students feel anxious or rushed. Instead, it's to provide a musical timer for the transition. Some teachers say, "I'm going to let my students choose the songs!" Well, okay, but I need to choose songs for myself that I can handle listening to again and again and again. The transition period is often the most stressful part of the class, as students will drop things and spill things and ask a million questions, and if there's a song playing that grates on my nerves, it just makes things worse. I start with the clean-up song from the very first day of school. It goes along perfectly with introducing some awesome classroom supplies--like math templates and colored pencils--and, when it's time to clean up, introducing the song and explaining what it means. "By the end of this song, we'll have everything cleaned up! What can we do to make this happen?" I always emphasize that no one is done until everyone is done. That is, if you have cleaned up your area, help someone else! After our first experience with the routine, we debrief and discuss the results. Did we accomplish the clean up in the amount of time? What could we do to improve? I write down our comments and display them again before the next transition. I always start with just one song, and then slowly introduce the others. Being familiar with the clean-up song is important, because it causes students to pay attention to it and know when it is just about over. -Reflection after the clean-up: With some groups, it's enough to say, "We didn't meet our goal. Why not?" and discuss it. Just the disappointment of not following through is enough. -Preferred Activity Time: If you use this management tool from Fred Jones, the addition or subtraction of time from the bank is a super-easy way to add accountability. -Time to sit before recess/another activity: I use this incredibly sparingly, not even once per school year, but it's effective and helps everyone understand the importance of working together. Whatever time we spend cleaning up after the song is over is taken from recess. Now, before you hate me for taking away recess, know that I never let the time progress past one minute for this, and I am always prompt with recess dismissal, never going past time for "one more thing." (In fact, I take kids out early at least once per week, just because we get everything finished and are ready to go!) We usually we clock in at 22 seconds or so late to recess, which is enough time to help kids understand that I am serious. Paired with my usual habit of taking kids out a minute or so early, this is very effective. I'm not sure why so many teachers are resistant to doing this. Want your classroom to go more smoothly? Put directions on the board. I have to teach kids to look at the board and read what is there. Usually I write simple directions, like "Get out your science notebook and write three questions you have about hurricanes." Sometimes the directions tell students to move into the next part of class, like "Pull out your independent reading book" or "Be ready for Quizlet Live". So that's it! A simple routine, a little of teaching at the start, and you too can amaze your colleagues and administrators by having kids clean up without saying anything at all. These first three songs are the ones that I've used for at least 10 years. That's right, ten+ years of transitions! I used to have these burned to a CD that I played from my bulky desktop. At 4:26, this song is perfect for longer transitions. Plus, the lyrics are interesting and keep students listening. ("Mrs. Kissner, why is a green dress cruel?") I can tell you that after 15 years of using this as a clean-up song, I still don't mind it. This classic is just about 3 minutes, and kids tolerate it pretty well. It has a nice key change toward the end that signals to students that the song is almost over, and it's pretty awesome to watch as everyone's movements become a little faster at this point. These are songs that I've added recently or by student request. I have this song on a different playlist of quiet songs, and a student asked for me to use it as a clean-up song. At 4:38, it's a great addition to the list. For some reason I ended up using this song a lot during math class at the end of the day. I just need something peaceful and quiet, and this is a beautiful adaptation of the classic song. It's funny, it's surprising, it has a great sing along video, and I like it.